Desert Academy, Santa Fe, USA "As a technical engineer it has made my life a lot easier. I used to work with squid which is very time consuming. CACHEBOX makes everything so easy." Khaled Aly, Miranet "We used to offer speeds between 500 and 800Kb/s but now we can offer an 800Kb/s minimum and an average of 1.5-2Meg per second"
CACHEBOX supports all the common deployment methods for Forward caches. We can help you choose the best one for your network. 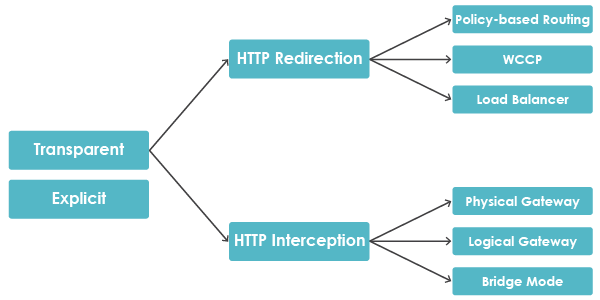 Most caches make requests to web servers using their own IP address. This can lead to a number of problems, including the inability to check what content was accessed by individual users. You can avoid these with CACHEBOX by using its Source Address Spoofing feature.